The Nashville Scene this week reported that Mac Wiseman, Hank Cochran and Ronnie Milsap were inducted into the Country Music Hall of Fame. Famed for his clear and mellow tenor voice, Mac Wiseman recorded with many great bluegrass bands, including those of Molly O’Day, Flatt & Scruggs, Bill Monroe, and the Osborne Brothers; his command of traditional material made him much in demand by bluegrass and folk fans alike. Wiseman was born in Crimora, Virginia and grew up influenced by traditional and religious music and such radio stars as Montana Slim Carter. Wiseman started out working as a radio announcer in Harrisonburg in 1944. At the same time he worked as a singer with Buddy Starcher. 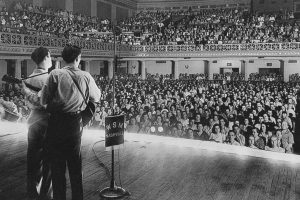 He later formed his own group and continued performing with others, including Molly O’Day and Flatt & Scruggs, through the ’40s. 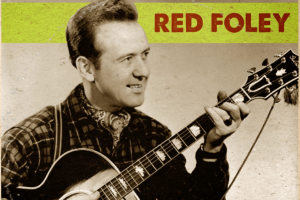 In 1949, he recorded a single, “Travelin’ Down This Lonesome Road,” with Bill Monroe. By the ’50s, Wiseman was again leading his own band. Above is Wiseman’s performance of “Carry Me Back to the Mountains” featuring Brother Oswald. It’s just great. The notes say that the dobro player is Bashful Brother Oswald. He is a terrific player and had a terrific name. His real name — Beecher Ray Kirby — is just about as good. The site will cover Cochran and Milsap in the future. Hank Mobley: "Soul Station" and "This I Dig of You"